The first batch of beer I ever made was simply what came in the Mr. Beer Kit that my sister got me for Christmas of 2008. It was Classic American Blonde Ale. One night, we were visiting my in-laws and just happened to bring some of my early beers, including one bottle of the Classic American Blonde Ale. It was everyone's favorite of the beers I brought. My mother-in-law "Huera" in particular really liked this blonde. Of course by that time I had already decided that I didn't want to just add water to HME and booster for my beers, and at some point I promised I would design a recipe and name that beer after her. But, I remember clearly telling her "I'm going to spell it with a 'W'" (the way people pronounce it sounds like it should be "Wetta"). So I made Wetta Blonde Ale with Mr. Beer Ingredients. And people liked it. A lot. Still to this day, I think it is Huera's favorite of all the beers I have ever made. I believe part of that is because it is named after her, but it is also her kind of beer. Even after I moved to all-grain brewing, but the one Mr. Beer recipe I continued to make the longest was this Wetta Blonde Ale. And then, I stopped making beers with HMEs at all. 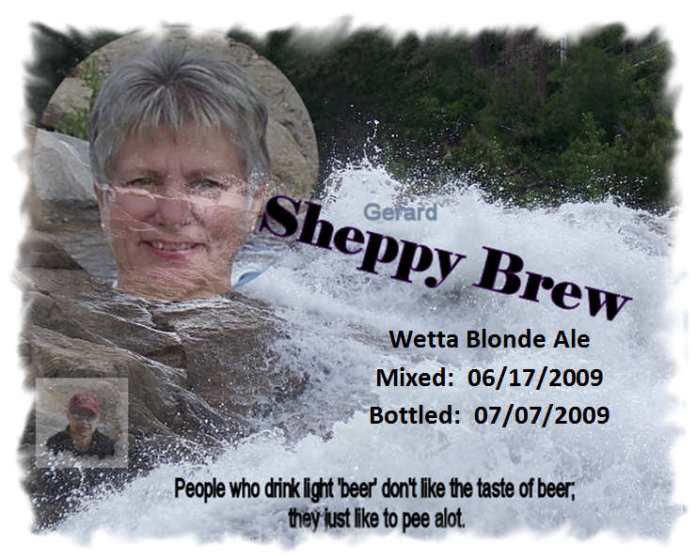 I converted some of my other Mr. Beer recipes to all-grain, but never did with Wetta Blonde. Instead of the Mr. Beer HME, I am using standard American 2-row malt with a bit of Munich and some C40. I am hopping it with EKG as that is what I used in the original Wetta Blonde, and I am adding some honey like the original recipe had. I have no idea if it will taste exactly the same, but I think it will be close enough for a first shot. I'll adjust after we taste the first batch. I think it should be good. Mash, sparge, and boil as directed. Remember first wort hops. Honey gets added at flameout. Pitch as close to 60 F as possible. Keep cold for first 24 hours, then let rise to no warmer than 68. 156 ... brought down to 150ish. Brewed this up today. Forgot to add honey to the pot. Ended up mixing to some water and added to 1.046 wort. Not sure what my of was. Probably pretty close to the 1.049. Strong fermentation. Temperature was 64ish for the first two days. Last night it made it up to 70. Still going strong this morning. The airlock was full.Added in a blow off tube. Seems to be done with the active fermentation, although there is a ton of kraussen on the top still. Took a gravity sample. 1.009 puts this beer at 5.2 ABV. FG will probably be a point or two lower. Taste starts off with a nice malt backbone that finishes dry. Good EKG hop present comes off sort of flowery. Most of the honey flavor fermented away, but I do pick up a bit. Actually exactly what I remember the Wetta Blonde to be. Think I may rack away from some of this kraussen today. I did end up racking to secondary yesterday. Not sure it was really as cloudy as I was thinking. The top sides just made me think it looked messy. Much nicer looking now. Took a gravity sample. Nice blonde color. Clarity could probably be better, but pretty good. 1.007 ish on the FG makes this a 5.5 abv beer. Nice malt flavor finishes pretty dry with a touch of honey flavor. Success! Kegging today or tomorrow. This beer has been a hit with family members. I like it too. More of a honey flavor in this beer than I remember from previous batches, but that might just be poor flavor memory. Plus, I think it adds a nice note to the beer. Can't think of anything I would do to change this recipe. Killed the keg last night. Yummy beer. Too bad its gone. Will have to brew again.